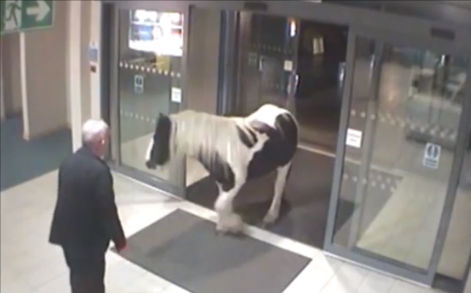 This hilarious footage shows a runaway pony walking into a Cheshire police station. It’s impossible to work out whether the four-legged animal was applying for a police horse job or handing itself in. Officers at Cheshire Police headquarters in Winsford were surprised by their equine visitor in the early hours on Monday morning (Oct 6). After its brief foray into the world of policing, the horse was quickly returned to its paddock. A spokesperson from Cheshire Police said: “During the early hours of the morning on Monday 6th of October, a local resident decided to check out Police HQ and was captured on CCTV. “Security staff at HQ were quick off the mark to greet a horse that had decided to investigate the HQ. 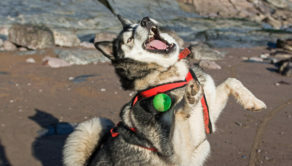 Husky hilariously fails at catch and his face in doing so is priceless!